AdderLink XDIP is a compact, easy to install, fanless matrix solution that runs on a standard IP network and enables users to extend and manage their computers with ultra-low latency, HD video and stereo audio. XDIP is scalable, from simple extension to small matrix. It is very well suited to small and medium sized installations. At their simplest, AdderLink XDIPs are high resolution, low latency digital KVM extenders which will operate just as easily across a direct 330 foot (100 m) CATx connection as they will across your standard 1Gb local network. However, there's much more to them than that. Many hosts, one console: XDIPs can form what might be termed a distributed KVM switch, where you authorize a single XDIP receiver to access up to eight separate XDIP transmitters and their connected PC host systems. Multiple consoles, one host: Alternatively, a different grouping of XDIPs can form a KVM sharer (aka KVM splitter or reverse KVM) to allow up to eight receivers to access and control the resources of a single PC host system. Many hosts, multiple consoles: A matrix of up to 8 computers (transmitters) and 8 users (receivers). The XDIP user and computer units are the same and assigned a role at set up. Every XDIP node arrives in Start of Life (SoL) mode: it's up to you to choose whether it becomes a transmitter or a receiver. This ensures that your small stock of nodes can efficiently meet your current requirements - and then be easily redistributed, in any order, to satisfy future issues too. To streamline the initial installation procedure, AdderLink XDIP nodes use a configuration wizard to guide you through the necessary stages. AdderLink XDIP configuration is primarily driven via the receiver(s). During the initial configuration and subsequent post-installation alterations, a transmitter can be configured via a receiver. HDMI is the native video port on each node, however, using suitable third party converters/adapters you can connect DVI, dualmode DisplayPort (DP++) or VGA signals at either end of the links. Every XDIP node features a feed-through port. This allows you to add a local console that can access both nearby and distant resources. 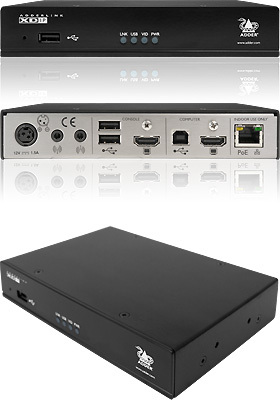 When the local console is placed on an XDIP receiver, it will operate as its own KVM switch. Alternatively, when the local console is attached to an XDIP transmitter, it will also act as a video splitter. A combined application of the feed-through and KVM sharer features could be used, for instance, to serve a lecture theater. AdderLink XDIP nodes are contained within slimline metal casings measuring just 6.65 x 4.4 x 1.2 in. (169 x 112 x 31mm). XDIP implements low latency, high quality, 60Hz video compression up to 1920x1200 to deliver an "at the computer" user experience over a standard Gigabit LAN. XDIP also supports stereo analog audio and USB 2.0 over a single CATx network cable. Video, USB 2.0 and audio all pass along a single minimum spec of CAT-5e cable allowing use of existing infrastructure cables in the building and an immediate ROI. Distance is linked to the IP standard of 330 feet (100 m) with a 40% overhead for safety. Longer distances are achieved by routing through your IP infrastructure. Video and USB feed through ports are available. These enable a local console at the source computer. A local computer is also supported at the user station. XDIP nodes can be configured as a simple extender, distributed KVM switch or KVM sharer or any combination up to 8 computers and 8 users (each user does not necessarily need to be connected to the same 8 computers). The extender has intelligent EDID management to allow the true characteristics of the monitor to be passed back to the computer or alternatively, a fixed EDID can be specified. There is no need for drivers or software to be installed. A simple wizard takes you through setup at the start of life of the product. CD-quality stereo audio (16-bit sampling at 48kHz) is passed between the local and remote units. Headphones are also supported (16 to 32 Ohms).